VAT is characterized by a set of very technical rules that are difficult to fathom for non-lawyers. However, economists are interested in the functioning of the VAT system in their analysis of trade transactions. This book provides a clear overview of the VAT-system in the EU. The focus lies on explaining the VAT consequences of economic transactions. The right of deduction has been referred to as the “cornerstone” of the VAT system, through the relationship between input and output one can even speak about the heart of the VAT system. The invoice which complies with the rules (possession of a correct invoice) is the “ticket of admission” to the right to deduct. The deduction system is meant to relieve the trader of the burden of the VAT payable or paid in the course of all his economic activities, provided these are subject to VAT. The approach is very practical. The VAT system is explained by means of examples, drawings and overview diagrams. Authors have to make choices. 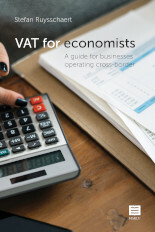 By separating essentials from side-issues we managed to write a book which contains the essence of VAT. International Health Law and Ethics. Basic Documents contains a collection of treaty documents and soft law on health care rights and health ethics, used in health law training programs. Regional documents and explanatory reports on health care rights, which are derived from international human rights law, provide a way of “unwrapping” government obligations in health care, making rights more specific, accessible and (judicially) accountable. In addition, soft law declarations and medical ethics contribute to understanding the moral meaning of human rights in health care. As such, the principles and standards provide practical guidance for States when dealing with equal access to health care services, the rights of (categories of) patients, biomedical research, organ donation and transplantation, genetics and public health. These topics structure the approach of International Health Law and Ethics. This guide covers the basic documents, while general comments and explanatory reports amplify the principles embodied in the human rights treaties. The authoritative interpretations clarify a ‘European approach’ on the State’s obligations concerning health care rights and ethics. This volume is an initiative of the Erasmus Observatory on Health Law. It will be a helpful guide for all trainers, health care professionals and students interested in human rights issues in health care. The present survey aims to analyze the issue of the indictment function in the process before the International Criminal Court which integrates a peculiar justice system, result of the complex interaction between the juridical tradition of civil law and the juridical tradition of common law. The prosecution function is entrusted to a Prosecutor who is conceived as a hybrid figure. It is an organ that not only performs its functions in the context of a system in which the principle of opportune penal action applies, but which also operates on a level that can be defined to some extent as political, since he has to move in an international chessboard and being called to also have diplomatic relations with states and international institutions. 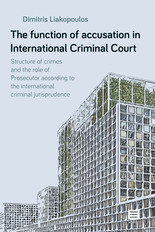 The discussion (Chapter 3 and 4) proposes a non-new theme, such as that of the structure of the crime in the tripartite system, and yet almost transfigured by the impact with international criminal law, which opens up unexpected and unpredictable scenarios, forcing the international criminal law to renounce and change: on the first , the abandonment of any systematic ambition is found, on the basis of the finding that the need for justice, the matrix of international criminal law, can not be enough to establish a system of crime, because the axiological assumptions are not easily convertible into incriminating norms. From the sequential treatment of typicality, anti-juridicality and guilt, in the complexity of the international dimension, only one certainty emerges. The contextual element, differently depending on the type of international crime in which it is inserted, is the discrimen regarding the common crime, and is impregnated with the marked depreciation of the Makrokriminalität. Chapter 5 is concentrated on some thoughts and perspectives of universalism and particularism coexist in the same historical moment and within the same juridical system, so as to underline a sort of internal dialectic in which universalism and particularism are in a necessarily mobile if not unstable equilibrium. And it is easy to understand how the positive right is naturally brought to privilege this second perspective without obviously neglecting the key offered by history to become aware of the deeper meaning of these two categories especially according, rectius under international criminal justice.